AKELEY, Minnesota (CNN) -- One quiet and creative couple is trying to clean up the world, one Christmas tree ornament at a time. They started with an ornament with a tree attached -- when an ornament is bought a tree is planted in the Chippiawa National Forest. The ornament's recipient gets a map locating the tree. "It took off -- we got such a wonderful response from people," said Jana Lung, president of Forevergreen. 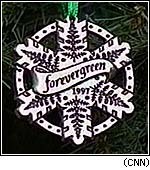 The small company now offers several ornaments made from recycled aluminum, and each benefits a related cause. The loon ornaments help preserve the bird's breeding grounds, while one showing pets beside a fireplace helps care for stray animals. Diversity has followed success. Proceeds from a birch canoe ornament, made from bark gathered from dead trees, helps clean up rivers. A line of soup kits benefits soup kitchens. Forevergreen says 51 percent of the profit from each sale is given away, and the Lungs work to make sure the donated money is spent they way they intended. Lung said the ornaments may be a small gesture, but they are a way to give and receive at the holidays.